Tangier Shrine Feztival of Trees — Sponsor a Tree! Your business or organization can sponsor a tree at the Feztival of Trees! Each tree is themed, and the theme is displayed with your tree. Your theme is limited only to your imagination! Tree themes during previous Feztival of Trees events included the Huskers, trains, dinosaurs, a chicken coop, entertainment/eating out, and a "money tree." 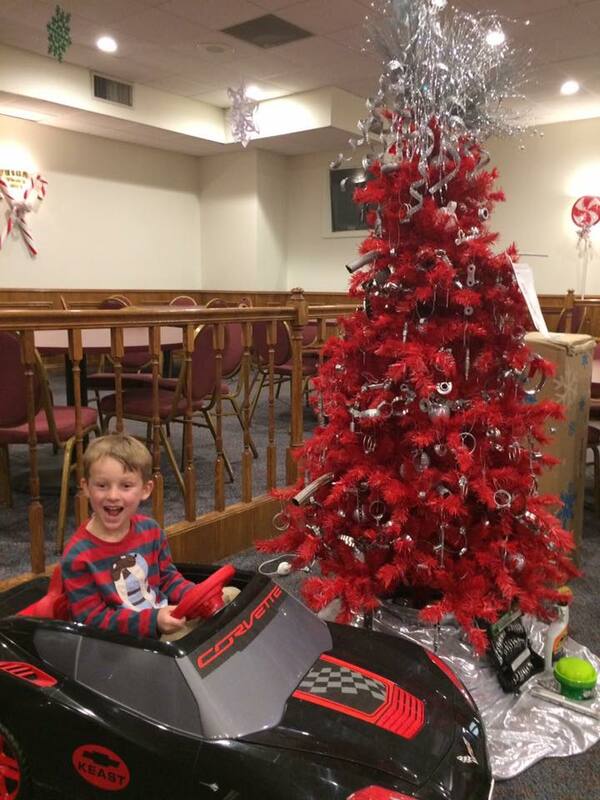 One tree sponsor (pictured), an automotive dealership — Keast Auto Center — included a drivable toy car and the tree decorations were auto parts! You can view a list of previous tree sponsors and themes here. Popular prizes include gift cards/gift certificates, toys, alcohol, televisions — and, of course — cash! Almost any type of company can be a sponsor: Retailers, grocery stores, car dealerships, sports teams, sporting goods stores, lumber yards, restaurants, movie theatres … you name it! Tree sponsors are recognized with signage at the event, on the event promotion materials (including social media, website, and emails), and in the Tangier Shrine Hot Sands newsletter. Businesses are also encouraged to promote your involvement through your own social media channels, advertising, signage, and internal and/or external emails. You are also welcome to distribute promotional materials and/or do a sampling and demos for your company within your display area, subject to approval. 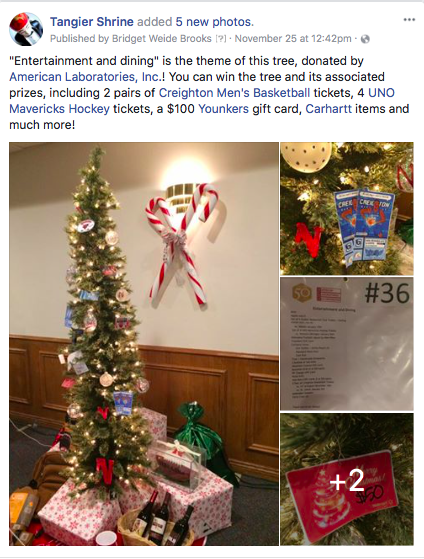 In 2019, the top five businesses or organizations that receive the most raffle ticket submissions are designated as "Feztival of Trees" Champions and will be recognized for their honor through social media and on the Tangier Shrine website. Interested in becoming a tree sponsor? Download the Tree Sponsor information packet here. The deadline for Tree Sponsor applications is Oct. 15, 2019. Tree sponsorships are accepted on a first-come, first-serve basis.